Trefolex and Tufnol ride again in Mechanical Engineering 101. Famously, the hero of Marcel Proust’s multi-volume novel, “A la Recherche du Temps Perdu”, found that memories of a period many years before were triggered by a smell and taste of tea and a dipped madeleine. Risking the bathetic after such a graceful idea and prose, The Lad found the opposite the other day: smells from his youth were triggered by this striking picture. It had been featured in a recent exhibition, Women War Artists (now closed), at the Imperial War Museum, London – website www.iwm.org.uk . Instantly, the workshop with its high roof appeared; it’s the Fifties. Machine tools are ranked in bays each controlled now by an apprentice in a white boiler suit. Each bay patrolled by its white coated Instructor. There was the low rumbling of the milling machines, the hum of the lathes just like the one in the picture, the hiss of the grinding machines. Equally pervasive was the smell of cutting oil and often the raw, burning smell of machined Tufnol – a composite material of linen and resin – still going It seems, [http://www.tufnol.com/tufnol/default.asp ]. But if it is a really vile smell you are after then it is in the fitting bay in the corner of the machine shop. Here are the benches and vices where there was hammering and a continuous swish of filing. There, on the bench were the pots of Trefolex, a thread-tapping paste, green coloured and with a vile stench. You can still get it today [http://www.warrenbestobell.co.uk/trefolex-cutting-compound.asp ] though they may have got rid of the smell by now. The Training School entertained both Trade Apprentices and Technical Apprentices. The Trade Apprentices were being aimed at careers as skilled machinists; whereas the Technical Apprentices were intended for the draughtsman’s career. Notice the suffix ‘man’. No women or girls then in the Fifties: they were all long gone after the Second World War. Not even an office girl. “Disturb the youths, you know”. But, contrary to the popular vision, the Training School does not represent the milieu of the professional engineer. It is Mechanical Engineering 101 where, then, he or nowadays often she discovers the basics before moving on. The mechanicals move on to design or work on new products for the machines to make, the production guys to introduce better machine tools or ways of dealing with difficult materials. It was here, in the Training School, that The Lad first tried cutting an external screw thread on a lathe with a single point tool. He found it difficult while the Trade Apprentices seemed always only to thrive on the challenge. Then they moved on to using the same technique to cut an internal thread. This is what Ruby Loftus in the picture is doing: under intense pressure in War time using the high skill of cutting what would be a buttress thread for a breech block of an artillery piece. This magnificent picture though is much more interesting than just for the memories of The Lad. The picture is, most importantly, but also so powerful, painted in 1943 the middle of the War, shows only a one male, a single small figure in the distant background. The thunder on the Home Front had changed everything. The painting of this picture shows that the changes were so radical that they had to be recorded. It was a peak in women’s employment never reached again even today. However, almost 70 years later, girls and women do take their proper place as apprentices and professional engineers. The dignity of Ruby and her concentration on the complex machine and work piece stands four-square with the haughty gaze of Henry VIII in Holbein’s painting. http://darkpassenger.tumblr.com/post/727152626/hans-holbein-portrait-of-henry-viii-1537 The painter was Dame Laura Knight who had, pre-war, specialised in painting dancers and circus performers. http://www.damelauraknight.com/biography.html . 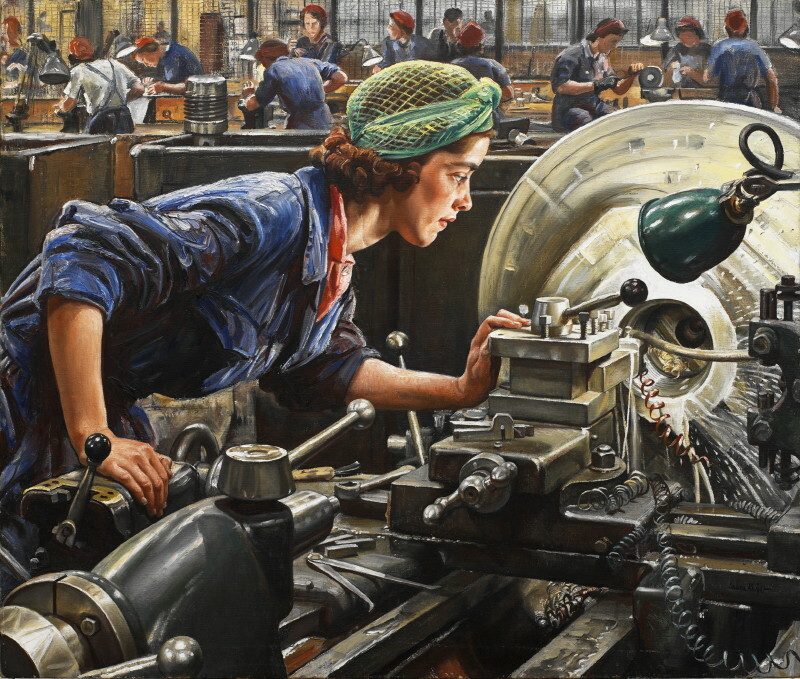 Though less important, The Lad believes this powerful painting is also the most accurate, realistic canvas of a rare subject – a snippet of Production Engineering. Unless, that is, someone else knows better. There is the contained poise and tension of the lean of Ruby. It is that of a dancer yet with stillness. Countering the figure of Ruby and closely observed, are the dark, gleaming masses of the lathe: the tool post, the carriage and the tail stock. The tools are there too: a scraper to remove burrs, an internal calliper for measurement, parting–off tools and tool holders and a ring spanner for the bolts on the carriage. Ruby is gazing intently at the spot lit tool. It is cutting the thread inside the breech ring during the very brief period as the tool passes from the side of the work piece nearest her out of the side within the rotating chuck. Her hands are not just supporting her but a part of her vital control of the machine. She rests the fingers of her left hand on the tool post to check and confirm the faint, continuous, humming vibration showing that all is well with the single point cutting tool. Her right hand performs the same check on the gearbox driving the feed screw and confirms that the carriage is moving. That same right hand was also well placed to switch off the drive to carriage and work piece in an instant when it left the inside surface of the work piece before reversing it back out in the same helical groove of the buttress thread but with a slightly deeper cut. Now, in the Twenty First Century, a CNC Turning centre does it all more quickly, just as accurately but with less involvement of a human operator – male or female. It was years ago when The Lad first reached for the spanner for the usual 3/8 UN nut. It wasn’t there. One of his compatriots had either left it lying around near where he used it last or nicked it for his tool box. In a busy workshop, it cannot be surprising if any tool goes walkabout. It happens even in the best, practical, production engineering school. But then everybody needed to use them so it was worth putting one that you have used back where it came from and everybody else could find it when they needed it. At least that’s what the instructors said – piously. 212 pieces and 67 kg! The Lad supposes that you could call it the secret of the engineer’s inner Nerd. But then who does not have such a secret? Why so many pieces? Well, if the golden path and self-styled foundation of the modern world – Information Technology – can suffer from legacy systems even in its youth; then so can Engineering, that has been around many times longer. As well, the spanner has several forms for different jobs such as open jaw; socket; ring spanner etc. 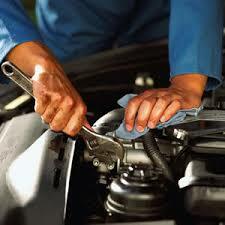 The spanner is important to a mechanic. The screw thread has an ancient lineage and so has the regular shape of a nut or bolt head, most often a hexagon, that is required to manipulate it. Both are still ubiquitous in all engineering structures. The ancient lineage means that in its early days many different standard sizes of nut, bolt or screw were used. A major problem was that interchangeability of fasteners between manufacturers and machines was impossible.The thing about screw threads is that they are likely to be in use in some machines for decades or even longer. If you want to maintain one of those machines, you need a matching spanner. It’s not just the diameter of the bolt that allows it to fit in a screw hole. Put simply it’s both the shape, usually a triangle, and also the depth of the spiral groove. The screw or bolt will not even begin to do its job if the bolt diameters match but both these features do not. 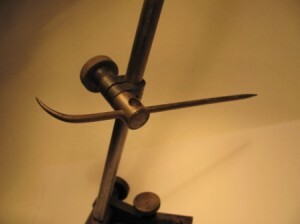 After an initial push in the early 19th Century when an accepted range screw thread designs that pairing a nominal screw or bolt diameter with a standard angle and depth of grooves was early seen to be useful subject for agreement between even competitive entrepreneurial engineering firms. A series developed by the great pioneer, Whitworth, and named after him became widely accepted. Around the same time also very widely used was the BA [British Association] series. This latter series had the advantage that the series went to much smaller diameters of screw which made it suitable for small instrument applications. 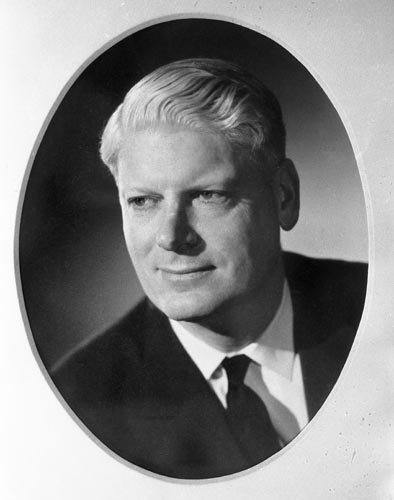 The United States had its own, non-interchangeable series’s known as the US Standard developed by the engineer, Sellars. For pictures of any of these threads without The Lad infringing any copyright consult any engineering handbook. It was only after the Second World War in the early 1940’s that further significant strides were made to reduce the still remaining variety of ‘standard’ designs. It was the unprecedented explosion of engineering production during and supporting the recovery after the war that led to the realisation of the serious inefficiencies and wasted costs were caused by the lack of an even more widely standardised, and interchangeable system of threads. At this the national engineering bodies of the USA and Canada and the UK came together to design a more rational series which they called the Unified series. Even this series was still restricted to the Imperial units of measurement. The final stage, to date, was to derive the ISO Metric series based upon the metric unit of length; that is the millimetre in the case of the thread. The Lad says the final stage but that will be completed only when everyone across the world uses the metric screw series. That’s certainly not easy and indeed he can’t say that it has yet happened. The USA still uses its standard AF [Across Flats] series widely. As engineering is the most powerful and essential tool in the advance of human civilisation across the globe and the management of force is at its core; so the screw thread in its principal task of storing force grew to be and remains vital to most engineering structures and power plants. It is a most subtle adaptation of the wedge whose unknown inventor must be saluted as a genius on a par with Isaac Newton and above Leonardo da Vinci. 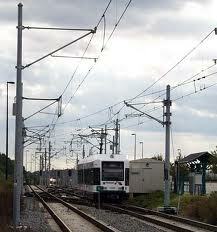 The Government has announced recently that £billions will be spent on UK Transport rail infrastructure. I assume that this will include the High Speed 2 plan linking London and Birmingham by electric railway. Those on the ground will always oppose the planned routes due mainly to the damaging effect on their house values. But many also will cite visual horrors of the railway cutting through the contryside. The Lad, although an engineer, can understand that to some degree. The trains and their sounds are soon passed at any given spot. But the masts, skeletal arms and the wire arcs are permanently on display. It should be possible to do better. The Lad is not a catenary support designer but, in the UK, notes that it appears that standard RSJ uprights and other ugly components have been flung together. The idea?? 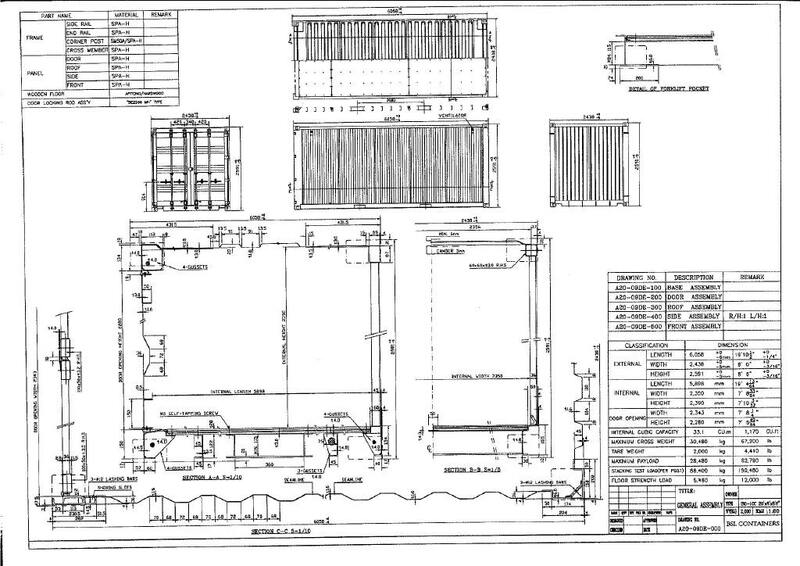 of using standard parts or RSJ material is assumed to be the best way to achieve cost-effective structures. There does not appear to be any thought for the visual effect. See the pictures, which come from the excellent website, http://www.theoverheadwire.blogspot.com/ with the kind permission of its author Jeff Wood of San Francisco. Let’s design aesthetically better designs than this. The Lad advocates a more holistic design. special components, possibly multi-use, could not only look better but also, he is sure, be more structurally and dynamically efficient. The cost of specially designed parts would not be more expensive. Why? Because in the hundreds of miles of line lengths there are multiple tracks and so there would be thousands of each given component. 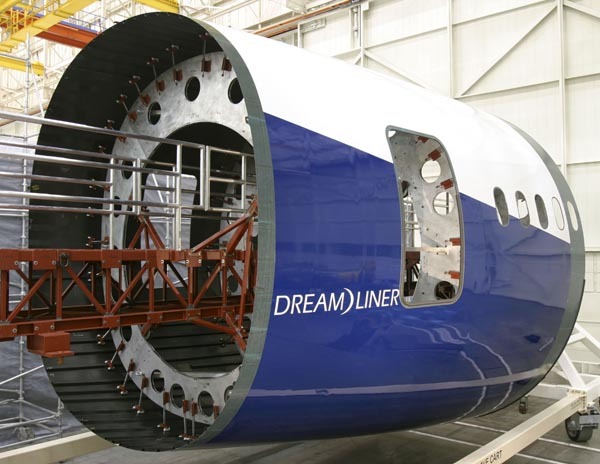 What happens to properly designed, component cost with large quantities? It plummets. This post is The Lad’s quick response to a problem that has been irritating him in the back of his mind for some years. I will develop a strategy to try and move the idea forward. I will try to find the movers and shakers in this area and see if he can begin any sort of dialogue. The Lad will keep the blog in touch with any progress or none as transpires. Engineering was a craft before the Industrial Revolution but then much changed. Is this a “statement of the bleedin’ obvious” as Basil Fawlty would have said. No. I am not referring to the invention of the Steam Engine and the various weaving machines in themselves. Simply put, it was the knock on effect, of interchangeable spares for those and other machines. 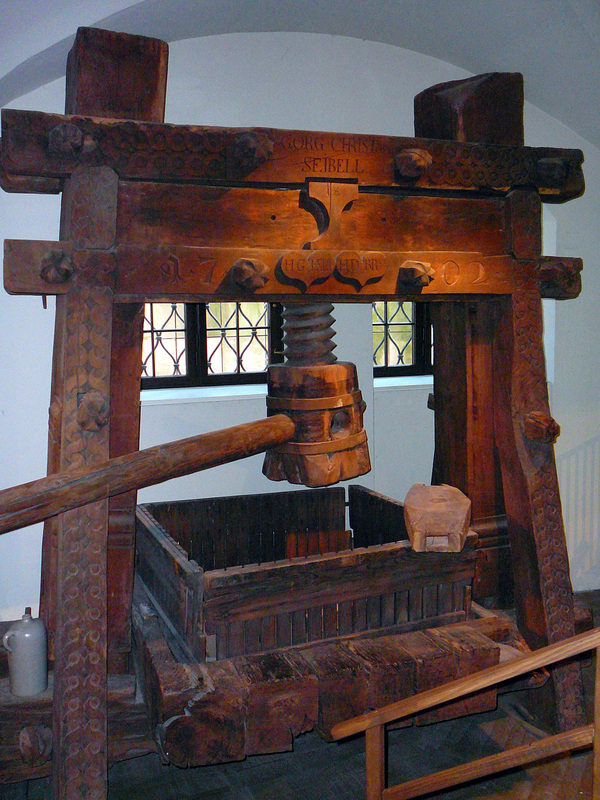 Before the Industrial Revolution each machine was made by hand. 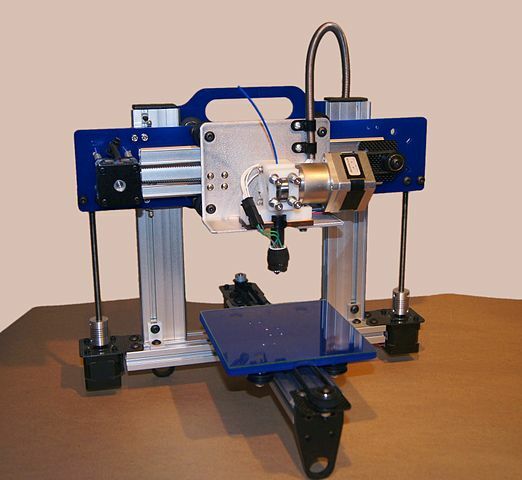 Each of its parts was made to fit sufficiently accurately and smoothly with only the other parts of that particular machine. As more machines went into service and, with time, they needed replacement parts. It was expensive and a pain to have to go to the machine in question and make a new part to fit. Not only a pain: possibly in a working assembled machine it would be impossible to ‘find the sizes’. Someone had the brilliant idea to make all the parts sufficiently accurately that any part would fit into any machine. The phrase “sufficiently accurately” is the secret here. All sorts of machine tools and techniques had to be developed to do the job but The Lad describes here only one. Much increased accuracy was needed compared to woodwork. Before, wood could accomodate some inaccuracy due to its flexibility, lesser rigidity, and its usual static not dynamic function. Before you can make something accurately to size, you have to know what that size is [See my later post on the micrometer]. Then you have to mark the material accurately to that size. One component of the marking out process was actually a pair of items. 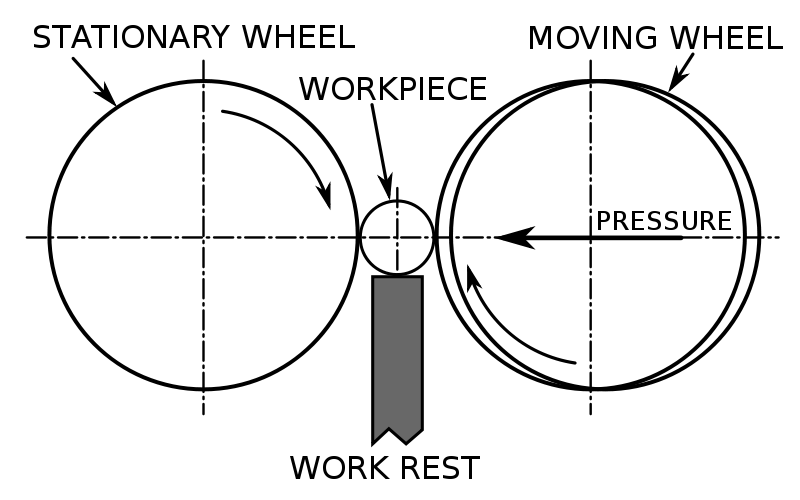 The surface table and the scribing block. The material that you are trying to make into an accurate component must be marked acurately, much more highly accurately than had been done previously. They need very fine lines permanently marked to a very accurate position. Then you can remove material to the marks. So: you stand the component on a very flat table usually made of cast iron, sometimes granite. If it is already machined, you may coat the surface with blue dye or copper sulphate to give a blue or coppery surface to make any scribed marks easy to see. A hard point mounted on a heavy block with a flat surface can then be set to a given, accurate height. 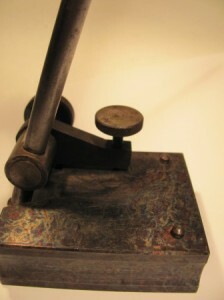 As it smoooooooothly glides, steel on cast iron, over the table’s flat surface, it scribes a fine line on the material. Turn the component through a right angle, reset the scriber to a different height perhaps and scribe another line crossing the first. There you have it. 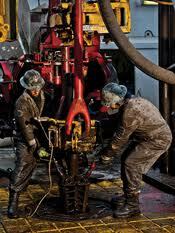 At the intersection, is the place to drill a hole accurately in position. The surface table is too big to form part of the current collection of The Lad. But the scribing block is not. Here it is in pictures. As well as the heavy base, note the heavy sections that give us a rigid structure. Under the small scribing load, this rigidity leads to almost zero deflection and thus mark-up accuracy. 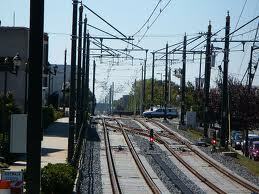 Sometimes the engineer is scribing several parallel fine lines on a horizontal surface rather than a vertical one. If so, she can use the machined straight edge of the table using the pins pushed down as shown to run along the edge. 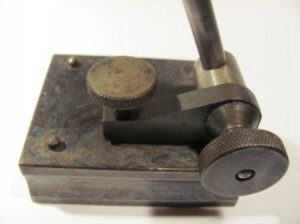 Even a cylindrical guide to the scribing can be used if she finds it necessary by mounting the vee in the base on the cylinder. 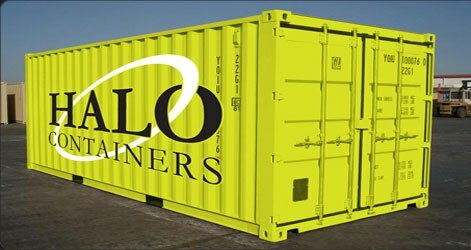 The whole unit weighs 1.1kg. The makers say that this one was made around 1965. The surface finish shows a slightly raddled beauty: it must have been very striking when it was new. I asked the Wolfson Heat Treatment Centre what the effect was. 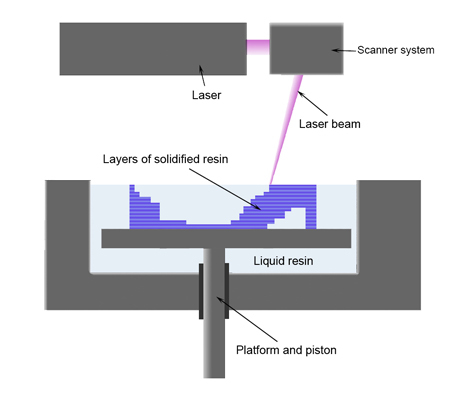 Derek Close and his colleagues suggest that it was made by steam blueing, a process where a component at greater than 600 degC is immersed in dry steam. It certainly has some corrosion resistant properties. I say this because all but the, ground, corroded, lower surface of the base is steam blued and is not corroded. This is one of the artefacts that The Lad collects. The essence of it is that it and the others in his collection are all things that The Lad has used albeit briefly. A scribing block has been around for a long time and its pedigree is tightly intertwined with engineering history. 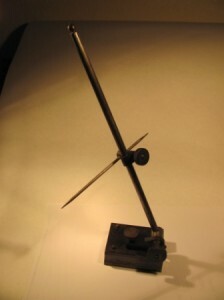 This tool was called a “surface gauge” in the Buck and Hickman 1958 catalogue at £2.60. This catalogue is a weighty gem from The Lad’s 1960’s collection of engineering books. The Lad has always called it a scribing block so he will stick to that. Moore and Wright still exist by the way in Sheffield and Hampshire but are owned by Bowers Metrology Group [http://www.moore-and-wright.com/]. 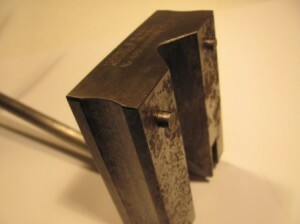 As an indication of a classic tool, the identical design of scribing block can still be bought new from Buck and Hickman that is also still thriving in 2010, http://www.buckandhickman.com/ . The current price is instructive though.